Cristi Fer Art Studio designed four One Painting in One Day distinctive workshops. Participants learn about composition, color and lots of hands on techniques. With easy to follow directions participants get great results, and in 3 1/2 hours finish a painting! 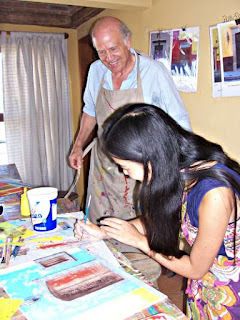 Participants varied in age and experience, but if they love to paint everybody has lots of fun and surprising results. The youngest participant was 8 and was accompanied by her grand mother. Families with teens, couples of all ages and genders, girlfriends, retirees, single people, I think I covered all San Miguel visitors! If you want to ad a fun painting day to your activities in San Miguel, contact us with your schedule and enroll in one of our One Painting in One Day workshops!